GRAND RAPIDS, MI USA -(Ammoland.com)- In my last article, I took a look at the beautiful Smith & Wesson Model 19 Classic. The Model 19 isn’t just a gun for those who love nostalgia, as the gun you can see here is a Model 19, but one that has a plethora of modern features. Today we will be taking a look at the new Model 19 Performance Center Carry Comp, which is anything but an old-school wheelgun. As we talked about in the last article, the Model 19 is something that harkens all the way back to the golden era of modern American culture. Unlike any other country in the world, America has a romantic relationship with the revolver that often supersedes technology and fashionable trends. A revolver, in almost any form, has significantly more personality than any automatic, perhaps with the exception of the 1911. In addition to having more personality, the revolver also speaks to the type of person that carries it. The person carrying a revolver is often seen as an individual not just of means, but of excellent taste. Because of the significant increase in power and corresponding reduction in capacity, marksmanship is a must and practice is absolutely necessary. Although that can be said of most guns, it is of particular importance in a revolver, as you really only get whatever is in the cylinder. This modernized and compacted version of the Model 19 is loaded with features that make it a perfect all-around gun for carry and field use. The finish is a durable, matte black with just a hint of sheen. Many people prefer a stainless gun for carry, but I have always liked the low profile of a dark, non-reflective finish. This modernized and compacted version of the Model 19 is loaded with features that make it a perfect all-around gun for carry and field use. The gun ships with two sets of grips. This is a great thing, as you don’t have to go looking for a new set if you don’t like the feel of the hardwood panels attached to the gun upon arrival at your local FFL. The rubber grips included in the box are very comfortable and offer just a bit more grip than the wood ones. I very much prefer the cushioning offered by the rubber, even though the .357 Magnum isn’t really a wrist-wrencher. In a self-defense situation or an excursion in the woods, the rubber grips are easier to hold onto in the wet and cold. Unlike many other compact .357 Magnum revolvers, this one is extremely mild to fire and hardly comes off target. The gun features a trademarked PowerPort vented barrel that does a remarkable job at mitigating muzzle jump. The buyer should know that ammunition that is not flash-suppressed can create a jet of flame that shoots straight up and cause the shooter to lose the front sight post for a brief millisecond. This is not a deal-breaker at all, just a consideration to make as far as ammunition selection. 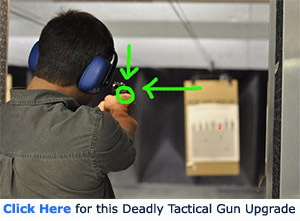 It should also be noted that the front sight has a tritium insert, which is an excellent addition for a carry gun. The gun features a trademarked PowerPort vented barrel that does a remarkable job at mitigating muzzle jump. Speaking of firing the gun, I tested this compact powerhouse with the same ammunition I used in the Model 19 Classic to see how it performed. The 19 Classic can be thought of a solid baseline for the performance of the .357 Magnum cartridge. I again tested the loads for accuracy at 25 yards from a stable rest. Groups are the average of three, five-shot groups at that distance. Velocity results are the average of five shots taken over my Oehler 35P chronograph while five feet from the muzzle. The shortened sight radius and corresponding shorter barrel resulted in slightly reduced velocities compared to the 4.25” 19 Classic. Most groups were a bit larger overall than those produced by its longer-barreled sibling, but the performance from a carry-size gun was still phenomenal when taken as a whole. Firing the gun was quite fun, although the porting again provided a bit of a challenge when practicing defensive drills. Point shooting was fully possible, as were fast follow-up shots. The thing to be aware of is that that same jet of hot gas that can cause flash with certain ammo can also shower your face and chin with microscopic, fast-moving particles. This is not something that is unique to this gun because virtually all revolvers have flashing around the cylinder face where the bullet leaves the cylinder and enters the barrel. It takes a little bit of practice to get used to, but the PowerPort is a great concept and really makes this gun comfortable and fast to shoot. The thing to be aware of is that that same jet of hot gas that can cause flash with certain ammo can also shower your face and chin with microscopic, fast-moving particles. The ammo I used to test this gun was powerful, but none of it was bad. Usually, a 34oz, 3” barreled .357 Magnum can be a bit hard to handle, but this gun was a total joy to use. The learning curve with a revolver can be steeper than with a semiautomatic, usually due to how difficult it can be to deal with under recoil, which usually means that reduced power ammo is used. The porting, weight, and balance of this gun make it possible to practice with full-power .357 Mag ammo without any discomfort. In the world of carry revolvers, there is often nothing but compromise. There seems to be an unlimited number of trade-offs associated with toting a wheelgun in 2018, especially when modern automatics are both reliable and lightweight. If you decide to go with a revolver for carrying, the Smith & Wesson Performance Center Model 19 Carry Comp is a prime choice that evenly balances power with performance. For more information on the Model 19 Classic, go to www.smith-wesson.com. Ammunition used in this article can be seen at www.hornady.com, www.black-hills.com,www.sigsauer.com, and www.hsammunition.com.